VAT implementation in UAE by the Federal Tax Authority (FTA) has made it extremely indispensable for companies and commercial organizations to get VAT registration in UAE and the tax registration number (TRN). As per the Federal Tax Authority, UAE VAT Registration requires businesses to complete the VAT registration form and setup an online account on the FTA website. Businesses are segregated on the basis of their annual turnover and mandatory registration threshold are specified accordingly. Shuraa Tax Consultants and Accountants helps companies with tax implementation in UAE as well as documents required for registration for VAT in Dubai and other Emirates. Whether you are confused on how to register for VAT in UAE, need to know about VAT registration procedure in Dubai or about the VAT registration cost in UAE - we are here to guide you. Shuraa Tax Consultants and Accountants is a one-stop-shop for all your UAE VAT registration services with convenient measures, easy-to-understand procedures and affordable VAT registration fees we provide complete guidance in terms of VAT registration online; recording you finances; book keeping services; VAT registration requirements; etc. 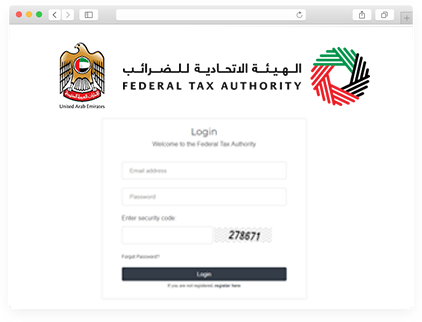 To fill up the Federal Tax Authority Registration log on to (https://eservices.tax.gov.ae/) or to understand in detail about UAE vat implementation contact Shuraa Tax Consultants and Accountants right away!